Thermopiles are thermocouple arrays that are wired in series and used in motion sensing applications. They are relatively simple in design and are built to perform non-contact temperature measurements. Thermopiles or thermocouple arrays are thermal flux meters that consist of a thin, continuous layer of conductor and semiconductor material. Typically, this material is covered on one or more surfaces with a thin deposit of copper. A 32 x 32 array of tiny thermopiles senses thermal energy and detects infrared (IR) radiation. The remote measurement of multiple points allows the thermocouple array to build a multi-dimensional image. Thermopile sensors detect the absolute amount of emitted thermal energy and generate a proportional thermoelectric voltage. 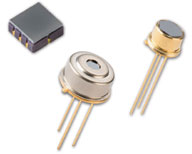 A thermopile sensor uses standard connectors and can measure a wide range of temperatures. Thermopiles are relatively inexpensive and often available as a thermopile detector. Metal type is an important consideration when selecting thermopiles. Base metal thermopiles can measure different temperature ranges, depending on the sensor material. Each type or designation represents a specific metal type and temperature range.